Welcome back Scandal fans! Season 5 started on Thursday night and it started out with Olivia and Fitz right where we left them – together. If you have been following my blog for awhile, you know I’m a huge fan of Olivia and Fitz together. I think they have the real, true love that everyone wants and although it isn’t easy for them, with him being President and all, I think they belong together. So, with that being said, you know where I’m coming from with my thoughts on this episode. So, like I said, the episode began with Olivia and Fitz together at the White House. The promotions department released the first scene of the episode as a sneak peak, which was probably a good move, because they were able to secure much of the Olitz fan base back in front of their TV screens. On the other hand, I wanted to see more and that whole first scene had already been revealed before hand! The cuteness that was Olivia and Fitz getting ready for the State Dinner together was almost too much to handle. The theme of the episode was fairy tale endings, and in the beginning we hear a monologue from Sally Langston in which she talks about the President and his love of fairy tales – his throwing a party in honor of the royal family of Caledonia. The prince in this family married an American citizen, and their story was meant to be a fairy tale. Of course, things aren’t always what they seem. From the beginning of the episode, Olivia’s story parallels the Princess’s story. 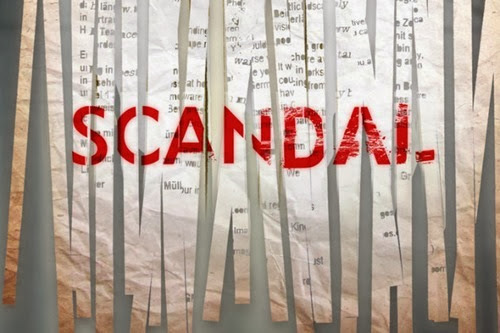 The best Scandal episodes are when the “Case of the Week” means something to Olivia and this episode was no different. She realizes early on that the Princess was a regular person until she married the Prince. Then her life became a spectacle. With the world watching, the Princess was put on display and it was very difficult for her to be her own person at that point. Olivia obviously internalizes this as what will happen when she and Fitz go public with their relationship. In what was probably the cutest scene of the episode, Olivia wears Fitz’s Navy t-shirt and gets ready for bed with him, but then she receives a phone call. In a story that reminds us of Princess Diana, Princess Emily has been in a deadly car accident and Olivia is tasked with retrieving photos that were taken at the scene in order to protect the Princess’s dignity. In doing so, she discovers that the car crash was not an accident. As it turns out, the Princess was having an affair with her bodyguard and was pregnant with his child. Olivia at first suspects the Prince, but soon realizes that the Queen was behind the murder because the Princess was not carrying an heir to the throne. Like in Season 2 when Fitz was shot, he realizes life is short and that he doesn’t want to wait to be with Olivia. He thus (finally!) serves Mellie with divorce papers. At this point, I would like to remind everyone that Fitz and Mellie were a political marriage to begin with and though their story is sad, they ultimately have not been in love with each other for years and years. For Mellie to suddenly act like she deserves Fitz’s love is insanity at best. Olivia is surprised that Fitz is planning to divorce Mellie so soon, but she seems to agree with him that moving forward is good. And Fitz agrees with her that they can wait until they are ready. Someone has leaked footage of them getting ready for the party together and Sally has aired it on her show. I actually predicted that Olivia would be outed at the end of this episode as what seems to be happening is a reset to the end of Season 2, when as is happening here, Olivia’s name was leaked. The difference being that at that time Olivia and Fitz were not together. This time they see Sally’s show together. Last time, Fitz was the one who leaked Olivia’s name in a strategy that he thought was a good idea but ended up not going the way he planned. Personally, I do not think he did it again. I believe the culprits to be Elizabeth North – the Chief of Staff – and Abby – the Press Secretary – because both were blindsided by Olivia in this episode. With Olivia having direct access to the President, he listens to her advice, sometimes causing difficulties for other people in the White House. While we are left wondering about Olivia’s fairy tale ending, we are also left wondering what those who are against her being with Fitz will do next. In the Case of the Week, Olivia got her happy ending – she told the Prince what his mother did and she will now be abdicating her throne to him. As Olivia tells her, Evil Queens tend to go down. So will this be the same fate suffered by whoever outed Olitz? Now, with our reset back to the end of Season 2, we will see how Olivia deals with once again being outed as the President’s lover – but this time, I hope to see her and Fitz dealing with the fallout together. If you watched, what did you think? ?